This week I’m linking up with Primary Polka Dots who is hosting a #tbt freebie link up! Click here to download this FREE Back to School Student Survey. It’s a great way to get to know your students! It doesn’t focus on any one subject area, but hits several topics (although there are a couple questions regarding reading). This gives me an idea of not only the students’ interests, but also how much time they spend online, playing on electronics, who does or doesn’t have internet access, what group roles they’re comfortable w/, etc. I’ve also found that students often don’t know how to attach a file when using programs such as Edmodo, or even when attaching a document in an email. This allows me to see who can and can’t do this. To check out Primary Polka Dots blog, click here! 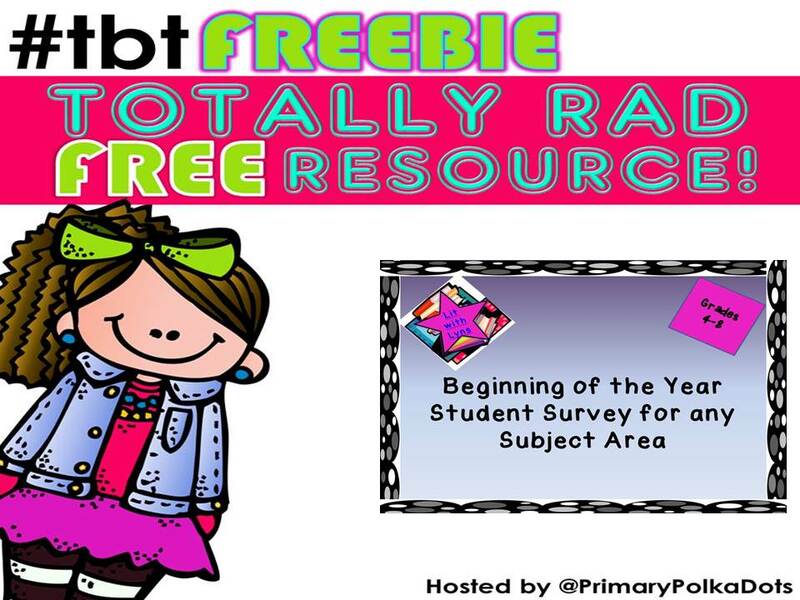 #TBTFreebie looks like fun! Glad to find another Middle School ELA teacher!